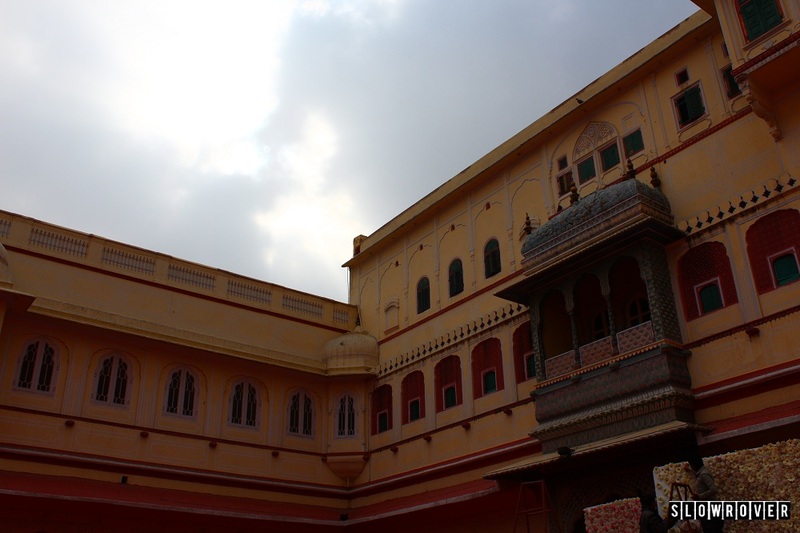 The City Palace is one of the most frequented tourist destination in Jaipur. Throngs of tourists, both Indian and foreigners, come to see this beautiful palace/museum everyday. All the tourists, whether they arrive in those mammoth Volvos or in the humble ‘desi’ alternative– the cycle rickshaws, have to enter the vicinity of the City Palace via a narrow gate. I call it the ‘Pigeon Gate‘ and this is where our story starts. Do you recall the “Coo-Coo” sound that a pigeon makes? Some people like it while some people abhor it. 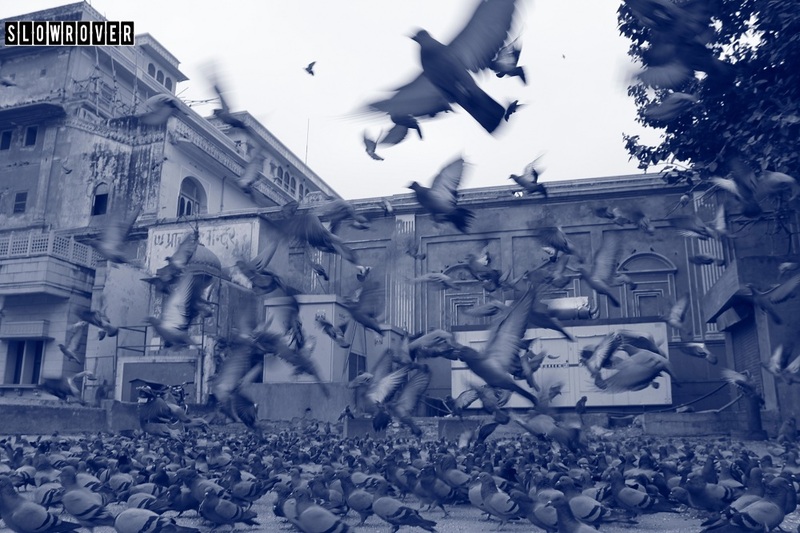 Now amplify the same Coo-Coo sound a million times, add to that the sound made by the flapping of an unimaginable number of wings– that’s what standing at the Pigeon Gate feels like. Now, don’t get me wrong. 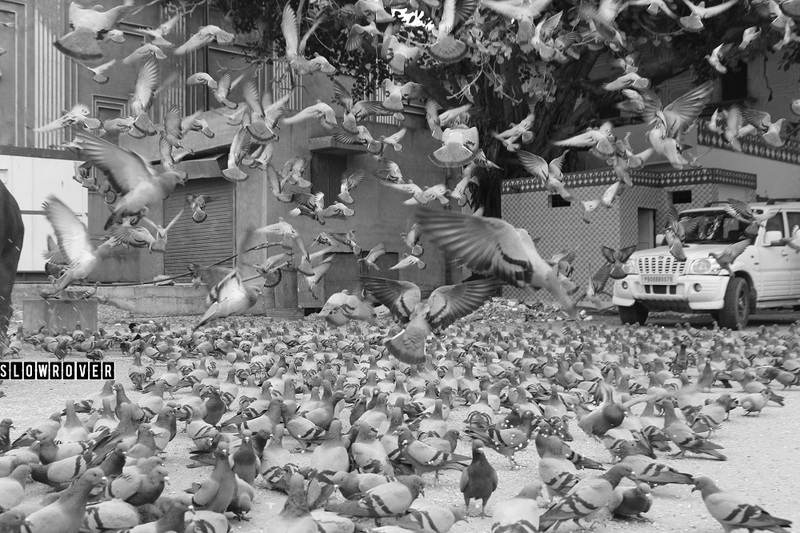 It is indeed an astonishingly overwhelming experience to be surrounded by pigeons who outnumber the population of certain European cities. But that’s not what this article is about. This article is about a symbiotic relationship between humans and pigeons, probably unique to this place. Right in front of the Pigeon Gate is a massive courtyard bisected by a busy road (the same road that passes through the Pigeon Gate and eventually leads to the City Palace). 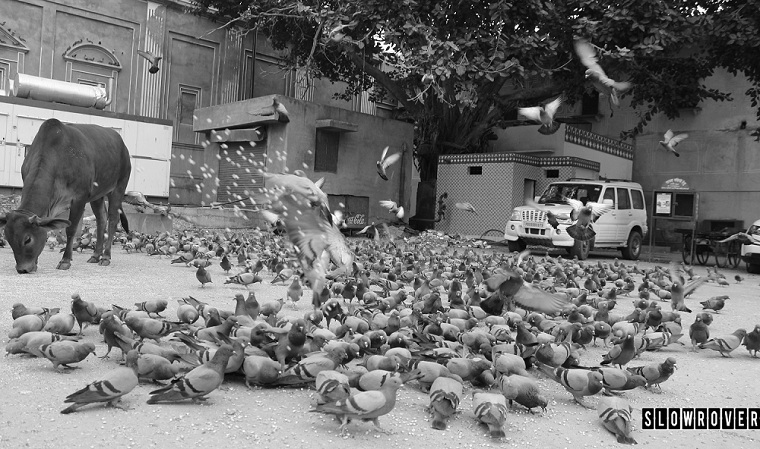 The vicinity of the courtyard seems to be the favourite hangout spot of all the Pigeons of Jaipur. Boy, do they rule this place! The reason for this strange endearment towards this particular area, as I later found out, is food! 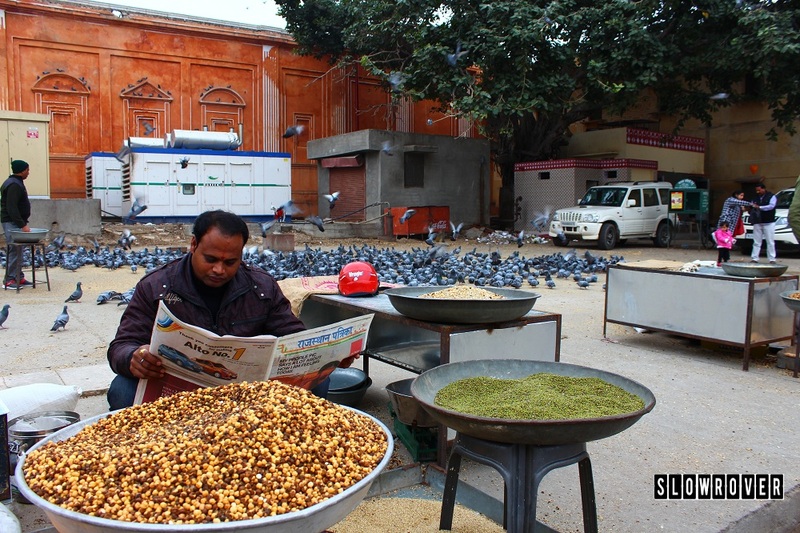 The courtyard is perennially brimming with food grains, purposely thrown by both the tourists and the locals. Meanwhile, Mrs. Cow enjoying the Feast! Flocks after flocks of pigeons accumulate all over and around the courtyard and hungrily gnaw at the abundant feast lying there. Once a flock has eaten to its heart’s content, it flies away from the spot to make way for the next flock of pigeons to do the same. Yes, all of them fly off at once! 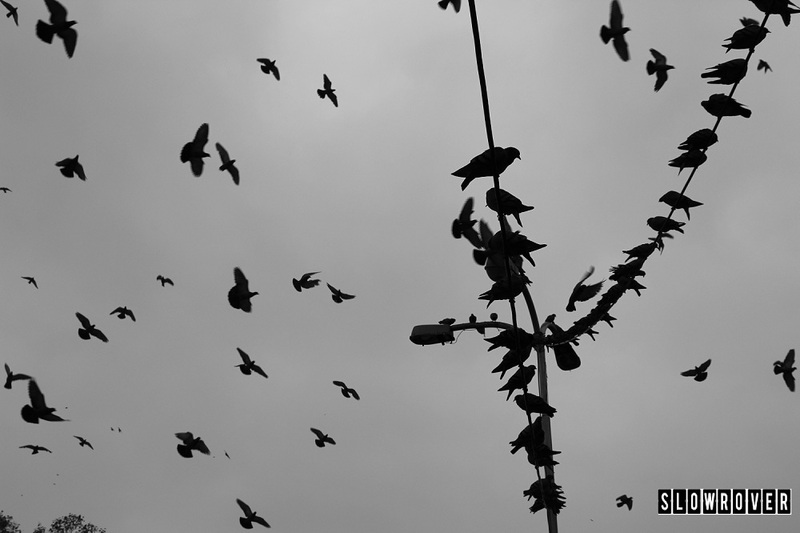 (And trust me, it is an unforgettable moment when a flock of thousands of pigeons just casually flies over your head!). Now here comes the interesting part. At one corner of the very same courtyard, a bunch of people were selling food-grains, which were kept in open baskets, to the tourists. Surprisingly, not even a single pigeon made an attempt to steal the food kept in the open baskets of the food-grain sellers. It was as if both the parties- the pigeons and the sellers, had made a silent agreement to keep this fruitful partnership going. Both of them respected each other’s territory. Both of them enjoyed the fruits! How beautiful! Struck by the discovery of this constructive paradigm, I broke into a smile of cognizance. 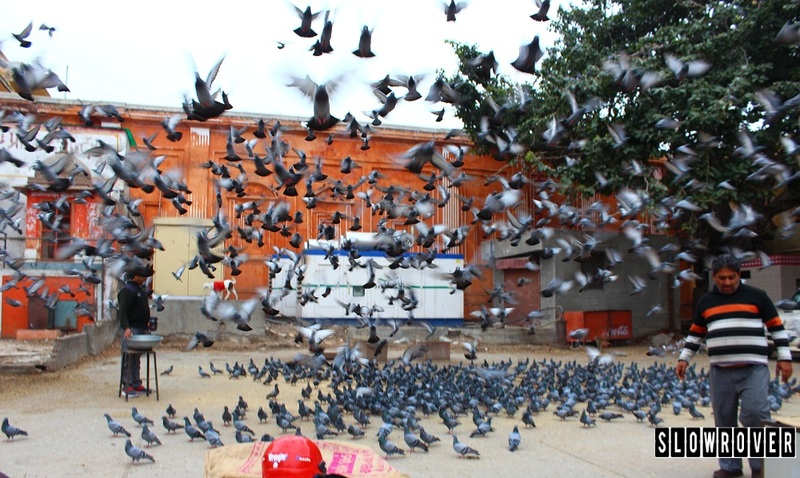 Since it was the only thing left to do, I bought a packet of grains for 60 bucks and fed the street smart pigeons. I couldn’t stop smiling the entire time. Neither could they. Find about more of his adventures on this super-awesome blog SlowRover.